The weather is getting colder and I find I’m making more comfort food. 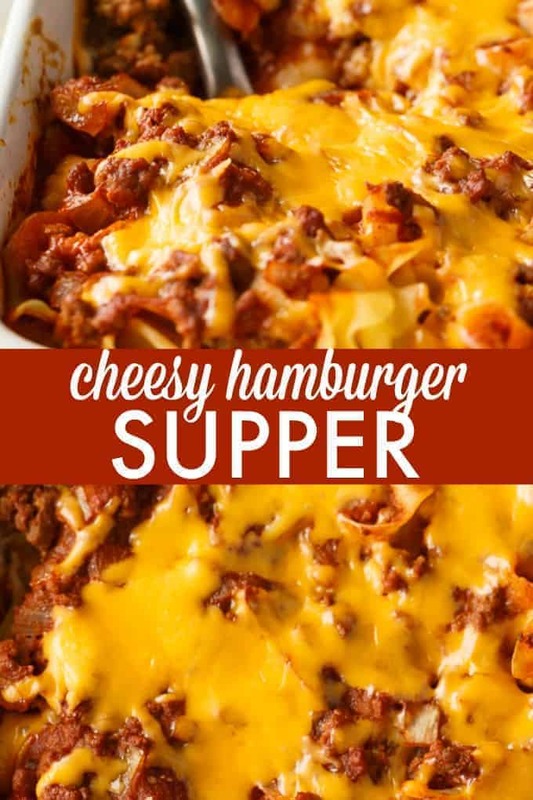 This Cheesy Hamburger Supper is packed full of YUM. It’s a meal in itself and very filling. It reminds me a little of lasagna with the beef, noodles and the cottage cheese. I also added cream cheese making it extra creamy and delicious. It even tastes great heated up and served the next day. My favourite part is all that oohey gooey cheese on top. This meal was a winner in my home even with my picky daughter. I’m sure if my other daughter were here she would like it, too. She’s away at university. Sniff, sniff. 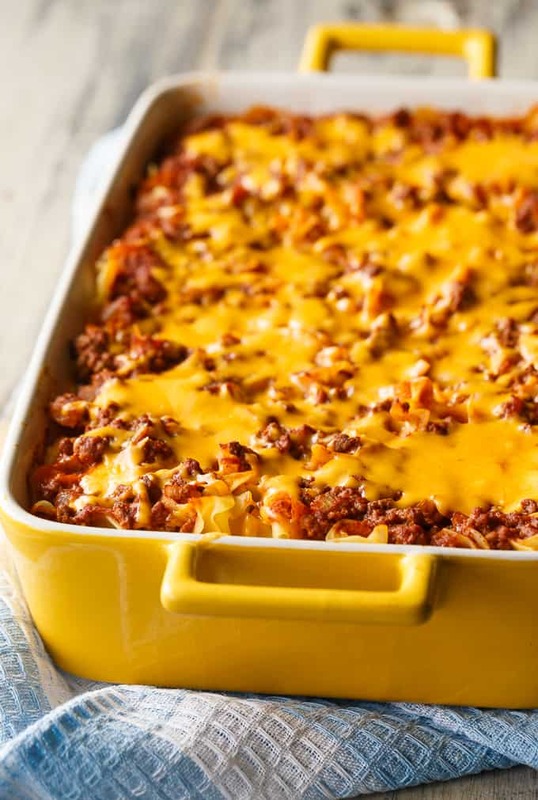 For more comfort food recipes, be sure to check out all my other casserole recipes. 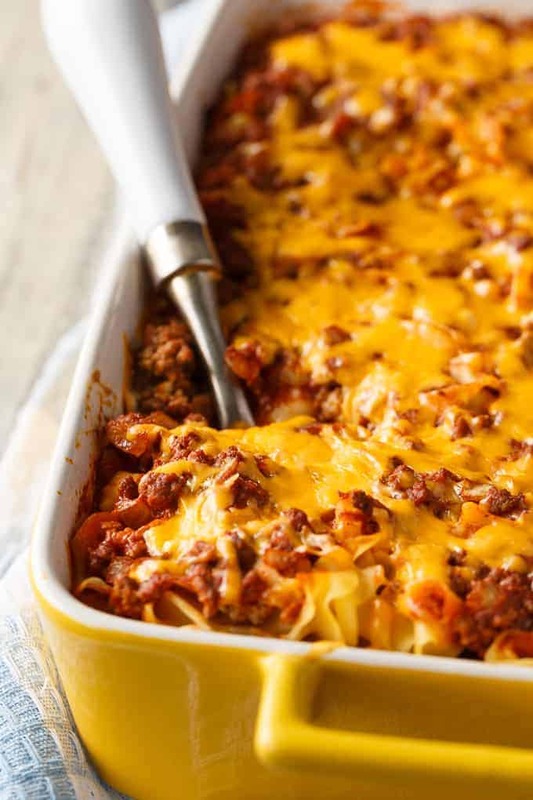 You might also like this Slow Cooker Lasagna or Shipwreck Casserole. If comfort food is your jam, you must try this recipe. It’s simple to make and the results are pure heaven. Enjoy! Pure comfort food heaven! It reminds me a little of lasagna with all the layers of flavours. Preheat oven to 350F. Grease a 9×13 casserole dish with cooking spray. Cook ground beef and onion in a skillet over medium high heat, until beef is cooked and onions are softened. Add tomato sauce, sugar, salt and garlic salt. Stir. In a medium bowl, stir together sour cream, cottage cheese and cream cheese. Add 1/2 of noodles to casserole dish followed by 1/2 of meat mixture and then all of the cheese mixture. Layer last 1/2 of noodles followed by last 1/2 of meat mixture. Bake for 30 minutes. Sprinkle with cheddar cheese. Bake an additional 5 minutes. Serve hot. This sounds like something my family would really like. I didn’t find them mushy. 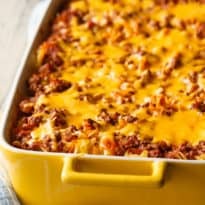 Cheesy Hamburger Supper will be a great family casserole for a cold winter night. Hope you have a fantastic week and thanks so much for sharing with us at Full Plate Thursday! My family will love this during the winter months. Thanks for sharing with us at Merry Monday. Pinned. Creative, and great for that hamburger lover in the fam. I love this dish! but these proportions do not seem right at all. I only used one thing of noodles.. and defiantly need more than 1 pound of meat in my opinion. The proportions just need to be adjusted to be a reasonable amounts with all components. Cannot wait to try this though, I think that it is going to be really delicious!